I've found Esslemont's previous Malazan books to be a bit mixed, at their best they have had some fascinating world-building and compelling plots but they have a tendency to be let down by often bland characterisation and some of his plots have been a bit underwhelming. 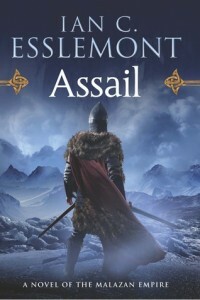 I thought Assail was a reasonably entertaining book but I think it's one of the Esslemont's weaker efforts. One problem is that the continent of Assail where the book is set is probably one of the less interesting settings in the Malazan world and it feels a bit underwhelming compared to how it has been built up by mentions in previous books by Erikson and Esslemont. In previous books Assail was referred to with dread by many characters but while it is an inhospitable land I would say there have been more forbidding settings in previous Malazan books (including the jungle setting of Esslemont’s last book, “Blood and Bone”). Many Malazan books are based on a diverse group of different factions journeying towards a convergence at the end of the novel and this is no exception. Most of the characters seem to spend most of the novel travelling to the same destination and while the pacing is reasonable (it isn't as tedious as some of the journeying in Erikson's later Malazan books) this part of the story isn't all that compelling. Once the journeying has ended the pace does pick up and the plot does become more compelling, the book does have a good ending and offers some conclusion to long-running plotlines first brought up in Erikson's books over a decade ago, although some bits do seem a bit rushed and a key part of the final confrontation seems to centre on a character I can barely remember from a previous Esslemont book. It's also a bit irritating that although it's nice to finally have a conclusion a plotline left hanging at the end of Erikson's "Memories of Ice" (which I read over a decade ago) virtually the first thing that happens in this book regarding the plotline is an explanation about why what the ending of Memories of Ice implied about the future was inaccurate, and the actual plotline seems less interesting than what I was expecting. I think the biggest problem is that while the characterisation isn't exactly bad (there are a decent variety of characters and there is some reasonable character development), there is a lack of really memorable characters. This is perhaps not helped by a sprawling cast that means most characters don't get a huge amount of time spent on them, even important characters like Silverfox. Comparing the two Malazan authors I'd say this is one area where Erikson does have a real advantage, while his characterisation was always a bit hit-and-miss he does have some fascinating and compelling characters. Overall, this is a moderately entertaining epic fantasy novel but I suspect it won’t turn out to be a particularly memorable one and it feels a bit underwhelming for something described on the cover as the ‘Final Novel of the Malazan Empire’.